Steneotarsonemus pallidus, or cyclamen mites, can be major pests on strawberries. Plants they infest are chlorotic and sickly looking because mites extract chlorophyll from the plants. Yellow or white stippling appears on leaves. New growth is stunted and older growth becomes distorted and curled. Flower buds may drop. Fruit that develops from infected buds are small and dry. Whole plants may have a bronze cast. Mites are minute arachnids, only measuring up to 1/25 inch. Under a magnifying lens, you will find that adults are red-orange and immature stages are somewhat translucent. The distorted growth and bronze cast of the plant occur due to toxins injected by the mites. They overwinter in the crowns of strawberry plants. 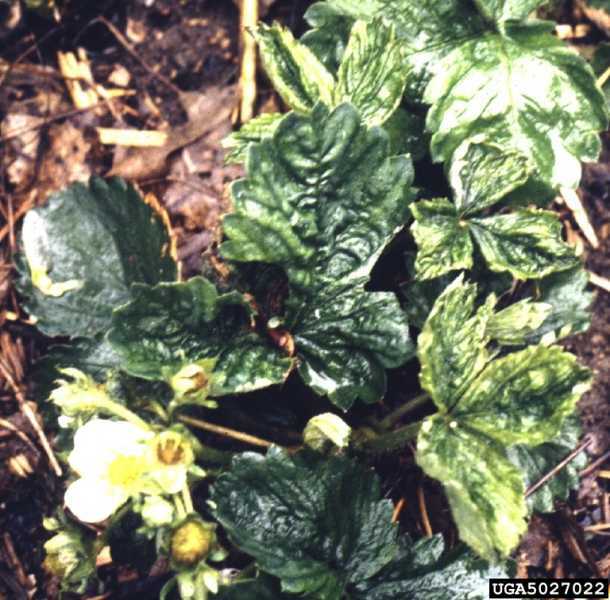 Mites can do serious damage to strawberry plantings because they can reproduce and spread quickly; a new generation may be produced every 14 days. 1. Apply insecticidal soap weekly until control is achieved to rid plants of mites. Make sure to cover the undersides of leaves because that is where these pests tend to be found feeding. 2. Remove and destroy infested plants. 3. Apply insecticides. Pesticides registered for use include dicofol (Kelthane and endosulfan (Thiodan). Strategy 2 is a strictly organic approach. For an organic approach to Strategy 1, consult the Organic Materials Review Institute (OMRI™) for appropriate insecticidal soap products.